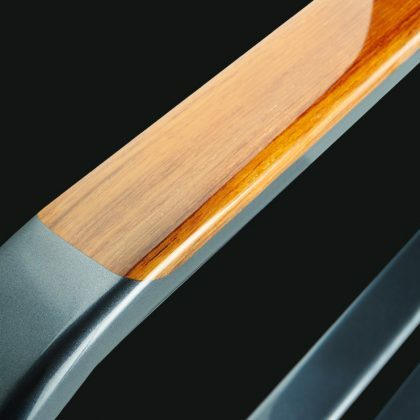 The multiguard system from multiplex is a railing made from pure carbon fibre, designed and shaped according to a client’s individual requirements. The design can range from the traditional three-section to curved shapes such as hearts, abstract figures or even logos. It can be attached to the deck quickly and securely using a proven 90-degree fastener. Stainless steel at the base of the stanchions provides 100-percent guarantee against corrosion. At the same time, its simple installation means that it is versatile and can be used in many applications, for example around a helipad, as the multiguard system can be erected and dismantled in no time at all. An individual segment weighs only about three to five kilos depending on its pattern and can therefore be stowed away easily on wall brackets. This saves an enormous amount of stowage space on deck. Despite its low weight the multiguard system can withstand a lateral pressure of up to 100 kilos and has been certified by Lloyds Register. As is standard with multiplex, the system is available in a free choice of colours with personalised advice and world-wide service.